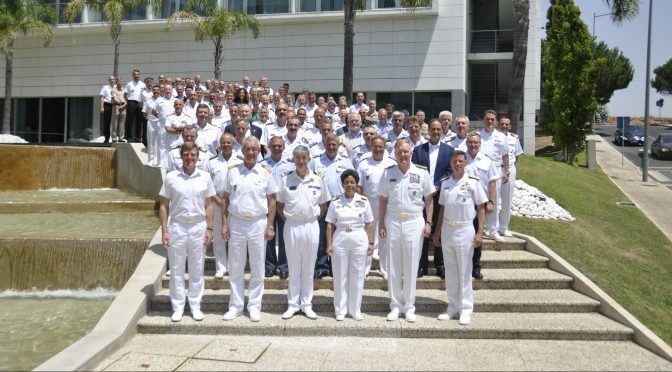 During the third week of July, Naval Striking and Support Forces NATO (STRIKFORNATO), together with Combined Joint Operations from the Sea, Centre of Excellence (CJOS COE), hosted the bi-annual Maritime Expeditionary Operations Conference (MEOC) in Oeiras, Portugal. The timing of the conference was opportune – the Warsaw Summit was held the week before, reaffirming the Alliance’s three core tasks: collective defense, crisis management, and cooperative security. The MEOC was able to capitalize on a maritime theme and contribute to the Summit’s two key pillars: protecting citizens through modern deterrence and defense, and projecting stability beyond borders. 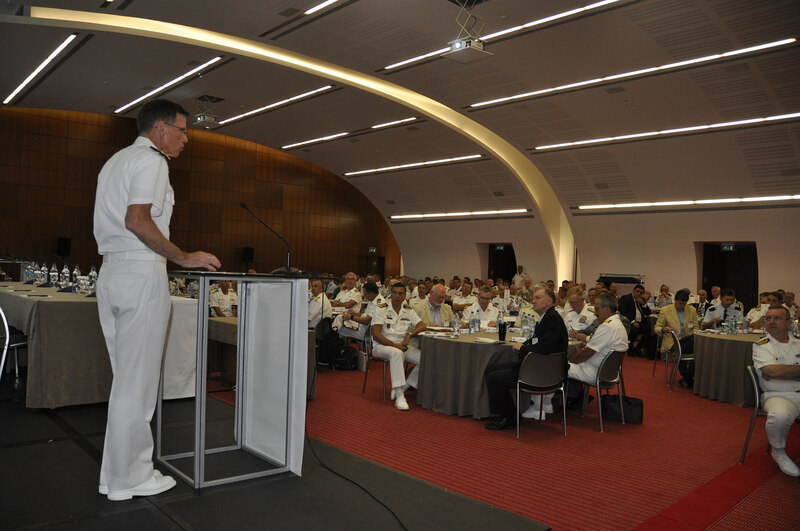 The conference brought together over 170 representatives from NATO Command and Force structures, academia, and national military commands from Allied and Partner Nations. Over the two days, attendees listened to five panels evolving from current threat, application of maritime expeditionary warfare, exercises and training, and the role of maritime partnerships. Each panel featured four distinguished Officers and/or Senior Executives and the highlight of the conference were three Keynote Speakers [i]: General Petr Pavel, CZE-A, Chairman of the Military Committee (MC), Admiral Michele Howard, USA-N, COM Allied Joint Forces Command Naples (JFCNP), and Admiral Manfred Nielson, DEU-N, Dep Supreme Allied Command Transformation (SACT). 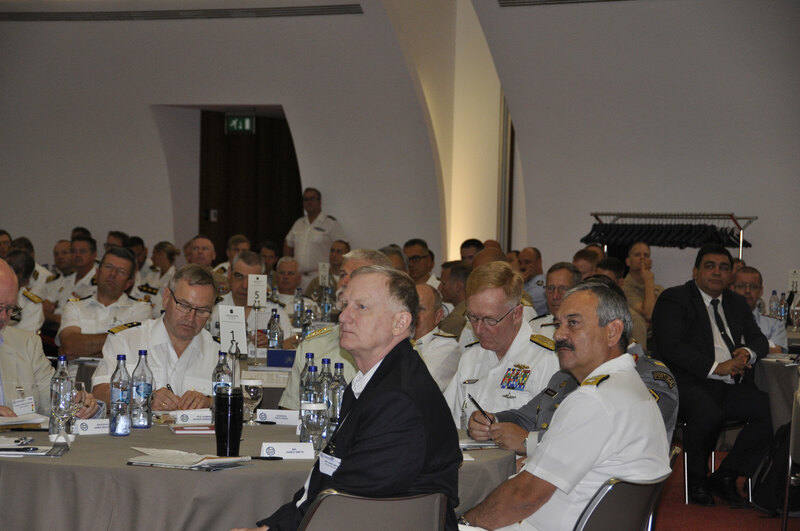 The goals of MEOC 16 were to define the future role of Maritime Expeditionary Operations (MEO) and how the capability can best be delivered to contribute to assurance and adaption measures in the evolving geopolitical sphere in light of emerging security challenges faced by the Alliance. During the five panel discussions, three themes came to the forefront: sources of instability, importance of joint and combined training, and partnership inside and outside the Alliance. Day 1 was largely dedicated to the maritime element of NATO’s adaptation to the surrounding borders of the Alliance. Arguably, Russia maintains a competitive advantage over the Alliance through rapid decision-making, strong public support of military actions, and the use of operations in the perceived grey space below the threshold of war. Recent moves by Russia have tested NATO’s unity and the Alliance should pay particular attention to the Baltic and Black Sea regions. To counter this aggressive posture, the first panel recommended the Alliance adapt a posture of constraint and engagement while maintaining the moral high ground through transparency. Credible and visible deterrence can be achieved through intensified Maritime Expeditionary Operational exercises such as the recent BALTOPS exercise, in which 14 NATO nations participated along with partners Finland and Sweden. Both the Baltic and Black Sea regions require a tailored solution that takes into account regional diversity while providing a cooperative and inclusive approach. In particular, the Black Sea’s importance as a strategic crossroads and cradle of Russian aggression requires cooperation with as many nations as possible including partners Ukraine and Georgia. Socioeconomic instability along the southern peripheries of the Alliance has caused mass migration and terrorist attacks to rise to an unprecedented level. The second panel focused on the effects of the deteriorating security situation in the Middle East and Africa and how the impact on NATO members will necessitate a review of NATO’s Area of Responsibility. As evolving threats continue to put new pressures on resources and priorities, NATO cannot act unilaterally in the region; it must cooperate with regional partners such as the African Union and Arab League to provide support. In the context of Maritime Expeditionary Operations, NATO can best provide a supporting role in functions such as maritime domain awareness, freedom of navigation, and port security. However, in a relatively new strategic direction for the Alliance, NATO must commit to understanding the complex environment to the south prior to proposing specific means of engagement. Day 2 focused on maritime exercises, training, and the role of maritime partnerships. NATO’s two primary maritime objectives are to deny use of the sea by adversaries and to deliver effects ashore. The former is an easily understood mission, but the latter includes multiple missions to include power projection, humanitarian assistance, noncombatant evacuation, and newer effects such as cyber warfare. In the event of invoking Article V, the most difficult situation for the Alliance at sea is operating Carrier Strike and Amphibious Tasking simultaneously with an appropriately agile and interoperable Command and Control Structure. Without the historical context of a past Article V mission at sea, the Alliance is left to develop trust and interoperability through training and exercises. One senior official was quoted, “trust cannot be surged,” it must be developed over time with quality training opportunities. All but 10 out of the 25 Alliance navies have fewer days at sea than planned per year. Allied navies must increase the number of large scale, unscripted combined and joint exercises while maximizing return on investment for the time and money spent by individual nations. Integrating the maritime and land forces of allied countries will allow the Alliance to train how it will fight. Partners offer regional expertise and experience that NATO can leverage to execute the Alliance Maritime Strategy. For example, Sweden’s in depth understanding of operations in the littoral environment or Japan’s grasp of the shifting military balance in East Asia can benefit Alliance security. Each potential maritime partner will have a unique relationship with the Alliance, each with its own political guidance and tailored cooperative engagements. Potential areas of cooperation with partners in the maritime domain include supporting rule of law, joint exercises, deeper intelligence sharing, capacity building, defense of sea lines of communications, joint capability development, and participation and training in NATO’s Centres of Excellence. Ultimately, partnering with other nations will drive the Alliance to be globally aware, agile, and enable NATO Maritime Expeditionary Operations to face emerging threats within and beyond the traditional NATO Area of Responsibility. LT Clarissa Butler is an E-2C Naval Flight Officer who has deployed in support of Operation ENDURING FREEDOM. She is currently working at Combined Joint Operations from the Sea, Centre of Excellence.